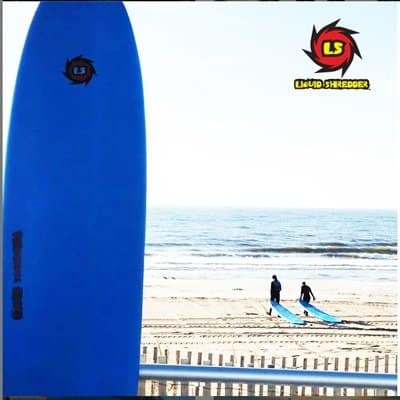 LS EZ-Slider Soft Surfboard, longboards are favorites of Surf Instructors across the Globe. Wide template is designed for beginners up to 210lbs, more for experienced riders. 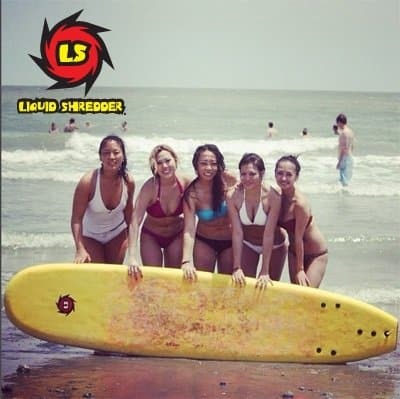 LS EZ-Slider Softtop Surfboard, Classic LongBoard Shape. Dims 9’0 x 24.5” x 3″ Weight 17.5lbs, Vol. 95lts. Removable Tri-Fin Thruster fin system. Fins included. Safety Foot Leash sold separately. The 9ft EZ Slider FSE Foamie Soft Surfboard longboard shape template is designed for beginners up to 210lbs, more for experienced riders. Dims 9’0 x 24.5” x 3″. 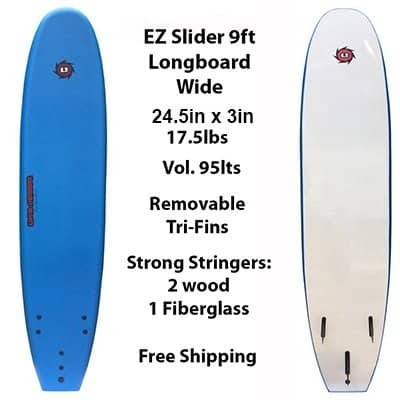 The soft foam deck of the 9ft Liquid Shredder EZ-Slider Soft Surfboard has an EPS core with Slick, Fast Bottom. Dual wooden and One Fiberglass stringers for strength. Heat laminated, no glue. Liquid Shredder 9ft FSE Foamie Soft Surfboard is proven in surf lessons, rentals and competition and carves the surf with grace and style. This Liquid Shredder beginner surfboard 9ft FSE Foamie Soft Surfboard is one real Shredder. It’s fast and I suppose it’s fast because it floats so well. I was paddling to an acquaintance and he commented about how fast the Shredder moved. I had been thinking the same thing. I’ve been out on this board 3 times. It’s been 50 years since I tried surfing. All 3 days were filled with small, gentle waves in the Seal Beach, California jetty area. I would caught most of the waves that I set out to catch from the beginning. It seem so easy compared to the old days. I had a fiberglass Gordy, 9′ 3″. It was a beautiful surfboard, but a tank (submarine?) compared to my Shredder. The Shredder’s light weight (17 pounds) helped me float well, even with my 215 pounds. I’m 6′ tall. It’s It’s a 9′ board. It’s just fine. Unlike a couple “foam” boards that I’ve read about, the shredder’s foam core has wrap-around (“extruded”) linoleum-like material covering its surface. I can’t say what’s used on the nearly flat bottom, but it must be some sort of light weight plastic. It does not “ding”: easily like a fiberglass board, either. I don’t know what a ding will look like if it can be dinged. I think that it’s going to suffer a dent of some sort before it has crack in it, like a ding. As a result, it feels like it’s going to last a long time; perhaps the rest of my life. I believe its design benefits the novice by creating a user friendly surfboard, which may have come about by chance during manufacturing. It doesn’t matter though because it helped me catch waves and helped steady my rides as I learned to stand, balance, and move on the board. If you are not familiar with this type of board, it doesn’t crack your head or ribs when bumping or crashing down as you wipe out. It’s soft exterior does not cause pain, although its fins (skegs) will hurt, but not like in the old days; not like those fiberglass boards with the large, sharp edge fins. I would buy this board again. Its cost was still more than I wanted to spend, but I not unhappy with it. I would like to get into the water more often to get more out of my investment. I’m considering a longer board, a paddle board for sanding up and moving around beyond the waves for the fun of it. I had not seen this done until recently. Now, that’s an expense well beyond the Shredder’s cost.